The best way for the railways to become more professional will be to get corporatised, says Subir Roy. There is a strong likelihood that we have seen the last of the railway Budget. The only person who can oppose the idea of ending the legacy practice of having a separate Budget for the railways is the railway minister of the day. But Suresh Prabhu wants to bury the venerable institution. The Union finance ministry is not terribly worked up either way and the public doesn’t know whether this will be good for it or not. 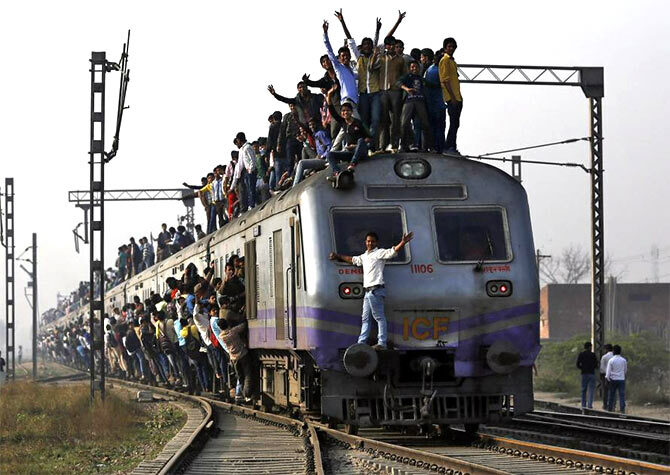 The greatest plus of abolishing the railway Budget is to do away with the chance it gives the railway minister of the day to grandstand before the nation and Parliament for an hour or more, when he feels obliged to announce a few new passenger trains and avoid raising passenger fares. This has severely damaged the financial health of the organisation over the years. If there is no Budget on which all attention is focused, fares can be raised with minimum fuss and fanfare. Sans Budget, key business decisions can be taken without them being politicised. This should, over time, put the railways on a firmer commercial footing, leading to better financial health. But it is important to realise that post Budget, the railways will not automatically become a more commercial entity. Theoretically, the carrier can become like any other departmental undertaking in which information is released by the ministry concerned virtually at its convenience. Lack of transparency is bad not just for stakeholders such as suppliers, customers and the society overall but eventually for the government, the sole shareholder, also, as the full cost of opacity becomes apparent only over time. Right now, the Budget and accompanying papers give a certain amount of very current information (revised estimates for the financial year) but you have to wait for the annual report which is a year behind for information such as average lead for wagons, which impacts wagon utilisation. Figures specific to a departmental undertaking are available not in the Union Budget but in the undertaking’s annual report. Imagine not knowing how the railways have done in a financial year till well after the year is over and long after most leading companies in the country have announced their earnings. The least that the minister should do right away is announce that even without a rail Budget speech, the rail Budget papers will be made available with the Union Budget papers. The point is, post Budget, the railways should not recede behind a departmental veil but rather quickly become more forthright with information and, overall, more transparent. The first step the railways needs to take to put itself on a more commercial footing is to restate its accounts on an accrual basis as do companies. The accounts need to fully subsume accrued liabilities like pension obligations. Also, there is no accurate assets register and provision for depreciation, so that the written-down value of assets is not known and the net profit is arrived at without properly providing for depreciation. There has been inordinate delay in the restating of accounts. It is not clear why proforma commercial accounts cannot be published quickly just to offer a contrast. These new-type accounts can be improved over time. There is obviously a vested interest in delaying action on this front which is trying to hide behind the desire for perfection. The best way for the railways to become more professional will be to get corporatised. The government can have as much shareholding as it wants to but even a token public shareholding will impose its own discipline and create value. Once this happens, raising resources from multiple sources will become easier as potential investors will have a clearer picture of the organisation. With this, the pressure to secure budgetary resources for investment will ease. The Union finance ministry should like this. The net amount to be transferred (budgetary support less dividend paid) will be commensurate with the development role visualised for the national carrier. Right now, the budgetary support, which is a loan in perpetuity, is partly used to pay dividend, which is really interest on the loan. So the railways is borrowing to pay interest! There is a development role for the railways under its social service obligations and the nation should be happy to pay for it. The only issue is, a lot of inefficiency has been hidden behind the railways’ need to discharge these obligations. The loss incurred on uneconomical freight rates for essential commodities and uneconomical lines should be computed by independent auditors according to costing norms used by other railways. This amount should be reimbursed by the finance ministry and the railways thereafter need to be held accountable for its performance. The greatest benefit from restating railways accounts along commercial lines is enabling accurate costing, which is vital if businesses have to be organised as profit centres, going down to individual trains. Without this it is not possible to know which line of business or line of service makes money or not. Mr Prabhu has taken the first step in the right direction. He has now to show that he can take on the vested interests within the railways which are resisting change through corporatisation. What the government or the ministry wants the railways to do can be incorporated in a memorandum of understanding which Navaratna public sector companies sign. This will create both accountability and autonomy.